Prime Minister Narendra Modi became prime minister in 2014 in the wake of his Bharatiya Janata Party (BJP) winning the Lok Sabha elections, the first time a single party achieved a majority in India’s lower house since 1984. 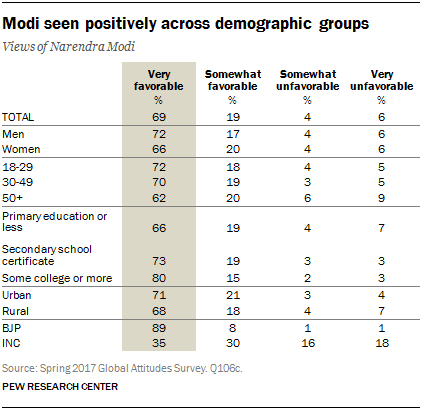 Nearly nine-in-ten Indians (88%) hold a favorable view of Modi. This includes 69% who express a very favorable opinion. Although support dipped slightly in 2016, it has recovered 12 percentage points in 2017 and now rivals that immediately after his election. Just one-in-ten Indians have an unfavorable view of the prime minister. Modi is very popular among men and women and among adults in both rural and urban areas. Young Indians, those ages 18 to 29, show slightly greater intensity of support than their elders, ages 50 and older. Perhaps not surprisingly, BJP supporters are more intense in their backing for their leader than are Congress party adherents. Almost everyone has an opinion about their prime minister; a scant 2% expressed no view. No other major political figure in India approaches Modi’s level of public support. A majority of adults hold a favorable opinion of both Rahul Gandhi, who led the Congress party in the 2014 election, and his mother Sonia Gandhi, the president of the party. Sonia is the widow of former Prime Minister Rajiv Gandhi. Support for both Congress party leaders is up from 2013, but it is down 5 points for Rahul and 8 points for Sonia since 2016. Slightly less than half of BJP supporters voice a favorable view of Rahul (46%) and Sonia (45%). Both Gandhis are more popular in rural areas than in urban areas, reflecting the long ties the Congress party has had with Indians in the countryside. Indians with a primary school education or less are more likely than those with some college or more to hold a favorable view of either Gandhi. Arvind Kejriwal is the chief minister of Delhi and the national convener of the Aam Aadmi Party (AAP). 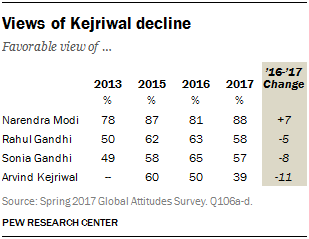 Kejriwal, who enjoyed widespread support in 2015 as he championed an anti-corruption agenda, has seen his backing fall 11 points since 2016 and 21 points since 2015. As of this year, roughly four-in-ten Indians (39%) see him in a favorable light. Prime Minister Modi receives widespread public approval of his handling of a myriad of domestic challenges facing Indian society today. Nearly three-quarters (73%) of Indian adults say a lack of employment opportunities is a very big problem in India. A comparable share of the public (72%) approves of the prime minister’s handling of this issue, and that assessment is up 10 points since 2016. 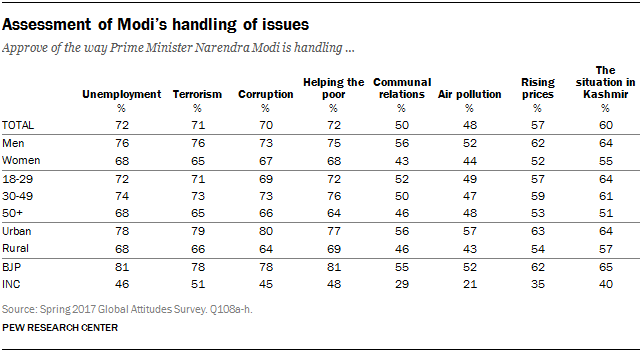 A similar share of the public cites corrupt officials (74%) and terrorism (76%) as very big challenges, and roughly seven-in-ten Indians approve of Modi’s record in dealing with each problem. Public approval of his handling of corruption is up 11 points and support for his dealings with terrorism is up 10 points. Rural Indians view the prime minister’s handling of corruption less favorably than do city dwellers. Reflecting the partisan divide over Modi’s tenure, half or more of BJP supporters, in many cases very strong majorities of those partisans, approve of Modi’s actions on a range of domestic problems. Roughly half or less, and in some cases an even smaller share, of Congress backers approve of Modi’s performance on these same issues. Modi’s lowest ratings are for his handling of communal relations (50%) – the long fractious tensions between Muslims and Hindus and India’s various castes – and for his efforts to curb air pollution (48%). Women are particularly critical of how he has dealt with communal relations, as are people living in northern India. And rural Indians are less supportive than those in urban areas of his handling of both communal relations and air pollution. But both of these issues are relatively low priorities for Indian adults. Notably, Indians with a primary school education or less are more judgmental than those with some college in assessing Modi’s dealings with various domestic problems. However, Indians with less education are also more likely than those with some college to hold no opinion on Modi’s handling of these issues. They are also the least positive about his actions on communal violence and air pollution. Modi’s conduct of international affairs is less central to the public’s day-to-day concerns. More than a third of those surveyed express no opinion about the prime minister’s handling of relations with prominent players on the world stage. This is particularly the case in eastern India – where roughly half or more offer no opinion about this aspect of the Modi government. A majority (55%) approves of the prime minister’s handling of relations with the United States and 36% hold no opinion on the matter. But this approval is down since 2015, when 66% said he was doing a good job in his dealings with Washington. Young Indians, those ages 18 to 29, are more supportive of Modi’s conduct of Indo-American relations than those 50 and older. However, nearly half of older Indians, and roughly one-third of younger Indians, say they have no view on this aspect of Modi’s performance. Less than half of Indian adults approve of Modi’s conduct of relations with Russia. Only a third rate the prime minister’s management of relations with China positively. And approximately one-in-five Indians support Modi’s dealings with Pakistan. None of these assessments have changed markedly in the past year. But nearly four-in-ten express no opinion on Modi’s handling of relations with each of these three countries. Indians with some college education are far more supportive than those with a primary school education or less of Modi’s handling of relations with these other key countries. However, 45% or more of those with a primary education or less offer no opinion, compared with roughly 15% who have at least some college education. Similarly, men are more supportive than women, though more than 40% of the women surveyed voice no view. Prime Minister Modi’s party, the BJP, continues to enjoy widespread public support. 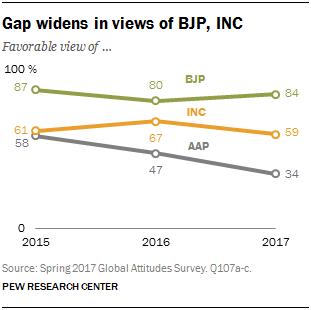 More than eight-in-ten Indians have a favorable view of the party, roughly its level of backing for the past three years. About six-in-ten Indians express a positive opinion of the Congress party. Again, this is fairly consistent with past support. But the gap between BJP and Congress backing, which was 26 points in 2015 and then narrowed to 13 points in 2016, has now widened again to 25 points. Indians in rural areas (63%) are more supportive of Congress than those in cities (51%). Those with a primary education or less are more likely to back Congress than are those with at least some college education. Notably, 60% of Congress party supporters have a favorable view of the BJP. Just 45% of BJP backers hold a positive opinion of the Congress party. Neither party’s supporters hold positive views of the AAP. The public’s opinion of the AAP continues to deteriorate. Just 34% hold a favorable view of the party, down 13 points from 2016 and 24 points from 2015. The public’s support for major institutions in Indian society, especially the intensity of that backing, varies widely. Indians overwhelmingly (86%) believe their national government has a good influence on the way things are going in the country. This includes 54% who say the central government in New Delhi has a very good influence. The intensity of such faith in the government is roughly comparable to what it was in 2015 (59%) but up significantly from the 29% who voiced a very good opinion in 2014. Those who say economic conditions in India are good are much more likely than those who say they are bad to voice the view that the government has a good influence on the way things are going in India (92% to 55%). BJP supporters (64%) are much more likely than Congress party adherents (37%) to express the view that the national government has a very good influence. The intensity of faith in the government among those who identify with the BJP has not changed much since 2015, but Congress supporters show a marked decline in their support (down from 50% very good in 2015). A comparable share of adults (86%) believe the military has a good influence, although the intensity of that support (62%) is even greater. Again, BJP supporters (63%) are more likely than Congress party backers (46%) to say the influence of the military is very good. Congress people are, however, almost twice as likely as BJP adherents to voice no opinion about the military. Roughly three-quarters of the public (76%) says the media, such as television, radio, newspapers and online news, have a good influence on the way things are going in India. But such sentiment is far less intensely felt (39% very good) and is down 16 points from public views in 2015. BJP supporters (79%) are much more likely than Congress backers (59%) to say the media have a good influence, and Congress supporters are somewhat more likely to have no view. Approximately two-thirds (68%) of adults believe the court system has a good influence. This faith in the courts is roughly split between very and somewhat strong. These views are largely unchanged from both 2014 and 2015. Today, young Indians (72%) are more likely than their elders (58%) to say the courts are a good influence, although 14% of the young and 17% of the older age group express no opinion. A similar share, with similar degrees of intensity, holds the view that human rights organizations and the police are a good influence. The weakest public support for an institution included in the survey is for religious leaders: Roughly half (53%) have a positive view of these leaders, with only 20% saying they are a very good influence. Indians with a primary school education or less voice lower backing for all these Indian institutions than do those with some college, though less educated Indians are also more likely to express no opinion.